With the growing presence of alternative digital payment solutions, the world has welcomed words like cashless and contactless in their techno-lexicon. According to Mobile Payments World, the mobile payment industry is expected to turn to $503 Billion industry by 2021- witnessing an annual growth of some 80% from 2015-2021. Also, increasing number of mobile payment mechanisms are being introduced. Think of the latest initiative of scan and pay system leveraged by Samsung and VISA cards. Integrating m-Payment features in your mobile apps will help you gain a competitive edge and will help you list your app in the list of convenient mobile apps. 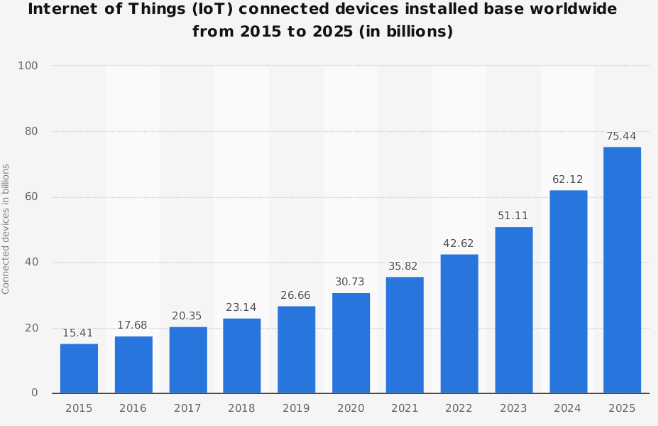 According to IDC, the worldwide spending on the Internet of Things (IoT) is predicted to reach $772.5 billion in 2018 showing a growth of 14.6% over the $674 billion that was spent in 2017. It also predicts to sustain a CAGR of 14.4% through 2017-2021 surpassing $1 trillion marks in 2020 while reaching $1.1 trillion in 2021. A massive amount of $19 trillion is predicted as profits and cost-savings from the investment in IoT. There’s a dire requirement for high-level programming for sensors, devices, web apps and both B2B and B2C mobile apps. 2018 is witnessing smart homes becoming more collaborative. Analysts predict some 1.9 billion smart home devices to be shipped by 2019 which could potentially generate revenue worth $490 billion. IoT integrations involve complicated mobile platforms and elaborate backend infrastructure to enable communication and data sharing between various devices to further enable a combined experience. For example, Beside Amazon’s Alexa, Nest and Ecobee are two budding giants that have pioneered smart home technology. While IoT is gaining popularity from all the domains, it is deeply penetrated in manufacturing, healthcare, and business. Smart cities will dominate the global IoT market share by 26%, followed by industrial IoT with 24% and connected cars with 20%. A research by IDC indicated an exponential growth in total wearable device reached 115.4 million units from 104.6 million units in 2016 showcasing growth of 10.3%. It is further predicted that by 2021, it will rise up to 222.3 million with a compound annual growth rate (CAGR) of 18.4%.The latest developments recommends the juggernauts of the wearable technology industry to develop products oriented towards applications. According to a research, wearable technology promises to improve productivity by 8.5% and employee satisfaction by 3.5%. Some industries might make optimum use of wearables. For instance, in healthcare sector, surgeons might wear Google Glass to supervise a patient during a crucial surgery without having to interrupt the procedure. Similarly, in manufacturing sector, organizations have used devices like XOne safety glasses which scans barcodes and streams video in real-time to various technicians who are off-site. The blockchain is the hottest topic in the tech industry today. While Blockchain is mostly identified with Cryptocurrencies and Fintech, it is worth noticing that this technology can be integrated virtually with any application owing to its security features like encryption and data integrity. Today, 9 in 10 government organizations plan to make investments in blockchain technology for their financial management, asset management, regulatory compliance procedures and contract management. Majority of the banks are expected to adopt blockchain in 2018. The blockchain is not only an irreversible ledger that is being leveraged to facilitate secure mobile payments via apps like Fold, BitPay, Gliph but it also can be optimally used in retail, logistics, real-estate, insurance, stock trading businesses to enhance efficiency. There are several instances of blockchain-dependent apps in the market today like Openbazaar, Chronicled, Riot Blockchain, Storj, BitPesa, with the number of apps and businesses looking to adopt Blockchain for its innumerable benefits is only set to increase in 2018. The app stores are brimming with over 100,000 health apps with a prediction of some 1.7 billion downloads of mhealth apps on various devices only in 2017. It was a tale of past when mHealth apps only showed number of steps a person has taken or may be to book an appointment with their clinician. Today, mHealth has transformed completely. 2018 has been about Electronic Medical Records (EMR) apps that helps you record your medical history, sort your medical bills and keep a check on serious health problems like asthma, diabetes or cancer on phones. Clinicians will step ahead by practicing critical operations using virtual reality based apps. Some of the popular mHealth apps are TotallyPregnant, HelpAround, Fitocracy, Insight Optics, Medici, Digital Pharmacist, Talkspace, Text4Baby, Doctor on demand, HelloMD and many more. 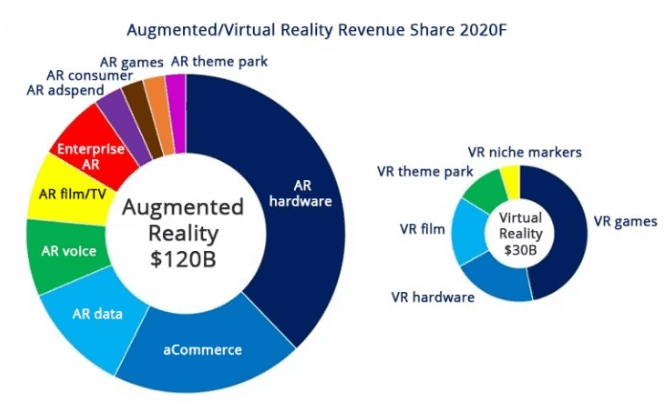 According to an analysis by Digi-Capital, AR/VR market is expected to hit $150 billion by 2020 with AR dominating with $120 billion followed by VR with $30 billion. With the introduction of Apple’s ARKit and Google’s ARCore in the market, the mobile app industry now has two rock-solid platforms for developing creative AR apps for various mobile devices to provide compelling user engagement and user experience. While AR/VR was restricted merely to gaming industry back in 2017, 2018 shall witness increasing adoption across various traditional industries too. Snapchat and Instagram are the fastest growing social media platforms to leverage AR and further plans to expand to make the platform more engaging and interactive. The use of AR is not limited to just businesses, but it extends to virtually all other domains like food, retail, education, and games. Some popular brands leveraging AR are Dominos, Starbucks, Cadbury, Walmart, IKEA, Volvo and many more. Introducing AR/VR in your mobile application will help you increase the conversion rate besides enhancing customer engagement, experience, and interaction with your brand. Progressive Web Apps are the perfect amalgamation of the best from mobile apps and web technologies catering mobile-like experience. It makes perfect sense to develop apps that don’t require users to go through the hassle of looking for it in the app store, downloading it and installing it before they could use it. The market analysis predicts that PWA’s will severely impact mobile strategies for numerous businesses in 2018. Characteristics like improved performance, simple updates, direct integration, trouble-free first run, speedy indexation, unified user experience, reduction in bounce rates while the rise in page views and increased conversion rate have PWAs in line with their native app counterparts. Twitter launched its PWA (Twitter Lite) last year which fetched them 65% rise in page views per session while reducing bounce rates by 20%. Also, Flipkart faced high uninstall rates for its native app was very heavy. Leveraging PWA it drives as much as 50% of their new clients in. Progressive Web Apps are in their early stages but denying their impact is impossible. 2018 will see a rise in PWAs. Instant Apps gives the user the freedom to ‘first-try’ and then install the apps that they actually want to use. Google will be adding ‘Try Now’ option to more number of apps in the play store than the present limited list. By tapping on it, users will get to access the preview of the app along with very basic features without needing to install the app on their handsets. 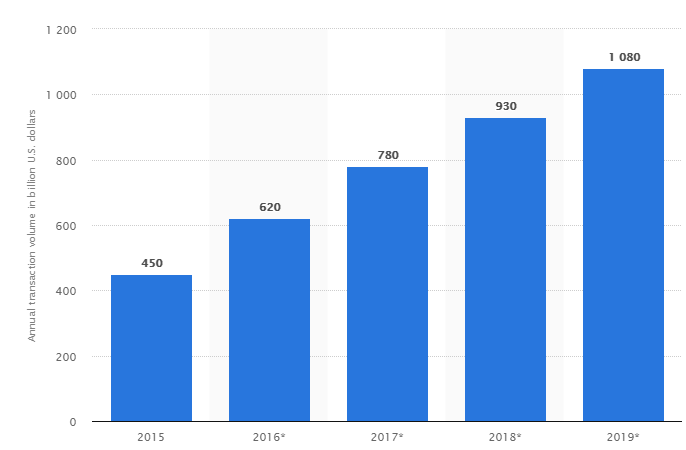 Instant apps, when introduced in 2017, were limited to just 7-8 apps in the store, but 2018 is going to witness a rise in the number of instant apps- a move that will bring excessive focus on quality. With the concept of Instant Apps, Google has put the ball in the user’s court which earlier used to be in-app publisher’s court. Vimeo, JET are some of the instant applications in the android app store. Google clubbed with Twitter to come up with the concept of Accelerated Mobile Pages to create web pages that are consistently faster, enticing and high-performing across all device and distribution platforms. Besides this, lazy loading assures that the users get to view the webpage even while some of its web page assets or components are yet to be loaded. These two features are remarkably vital for apps whose content is syndicated through content on web pages. This would cut down application start-up time as well as limit memory usage. From SEO perspective, these steps transform all the mobile app development approaches allowing businesses to increase CTR to their apps, increase their ad visibility and improve their page rankings. As per the research by BIA/Kelsey, on-demand app economy is predicted to touch $57 billion by the end of 2018 itself. Users spent 98% more of their time on on-demand apps for entertainment purpose as compared to the year 2016. The need for every demand to be satisfied instantly has given rise to on-demand app technology. Having all the services at your fingertips, with easy digital payment modes and responsive designs, will become the norm in coming years. Popular on-demand app players include Netflix, Uber, Airbnb and many more. To stay at a competitive edge in the industry, you should think of catering a unique service app idea that can further ease the customer’s need. The ultimate key to future in mobile app development is -Versatility. The app development world is continually been pushed towards cross-platform apps because of factors like wide user reach, cost-effectiveness, improved marketing and increased revenue. With the users increasing neck by a neck on both Android and iOS platforms, brands will adjust their mobile app strategies and incline towards developing an app that works on multiple platforms. According to a research by Forbes, the total global public cloud market is predicted to grow to $178 billion in 2018. Furthermore, it will continue to grow at a whopping rate of 22% CAGR (Compound Annual Growth Rate). As per predictions, Amazon Web Services (AWS), Google and Microsoft Azure are predicted to capture 76% of all cloud platform revenue in 2018 and some 80% by 2020. Cloud computing in mobile apps provides easy data storage and processing of heavy tasks while increasing reliability, speed and security of mobile apps. In the real world, it is largely about not affecting your devices’ internal memory. That is one key reason why Google Drive, Dropbox, and other such apps are gaining more popularity. Cloud-based apps are also closely linked to Bring Your Own Device (BYOD) method, which is yet another trend expected in 2018.
Business Intelligence, CRM, big data are all crucial terms buzzing in the world of enterprise apps in 2018. Companies will possibly identify subscription model as an assurance for growth. While Adobe, Amazon, Netflix may have been early birds to implement this model, we will surely see more software being licensed on a periodical basis for it assures a steady stream of income. Another aspect enterprises might focus is company-wide communication solution. One must consider safe software for enterprise-wide communication like Slack, HipChat, Skype for business, Workplace by Facebook or any other. With increasing customer demands for seamless interactions with brands, they are now expecting communication channels to be accessible 24/7. According to a research, 53% of the customers prefer to interact with a brand via messaging app rather than over the phone or in person. AI empowers users with enticing features in mobile apps like recommendation engines, more personalized experience, behavioral targeting and more. Chatbots continues to do their job of answering to user queries while taking customer service to a new level in 2018. Chatbots with AI will now answer queries that are not even asked yet. Or to step up, they will provide alternate solutions to mobile users eradicating the chance of knowing who is behind the screen. Juniper Research forecast chatbots to be responsible for cost savings of over $8 billion annually by 2022, up from $20 million in 2017. Gartner predicts that chatbots will power 85% of all customer service interactions by the year 2020. Report from IDC says that by 2019, 75% of workers using enterprise applications will take help of intelligent personal assistants for increasing efficiency and productivity. Furthermore, the industry’s focus will be inclined to bringing the real and the virtual worlds closer than ever before. 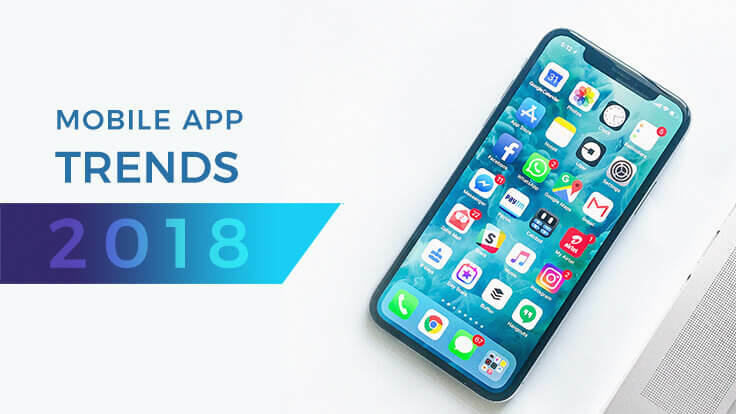 Now that we know the Top Mobile App Trends in 2018, don’t forget to align your mobile apps to these market trends. We at AIMDek, cater customer-centric and future-proof mobile app development services. Write to us at marketing@aimdek.com if you need any assistance with developing a cutting-edge mobile application.